This class represents the concept of an instantiation of function template. Definition at line 190739 of file Cxx_Grammar.h. 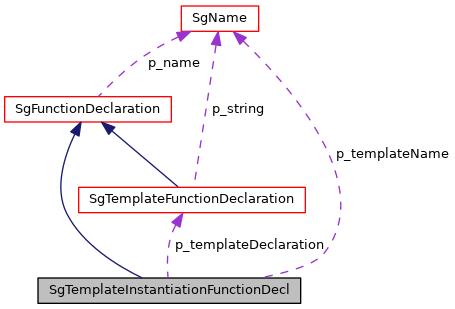 Cast function (from derived class to SgTemplateInstantiationFunctionDecl pointer). This functions returns a SgTemplateInstantiationFunctionDecl pointer for any input of a pointer to an object derived from a SgTemplateInstantiationFunctionDecl. Returns valid pointer to SgTemplateInstantiationFunctionDecl if input is derived from a SgLocatedNode. Definition at line 191232 of file Cxx_Grammar.h.